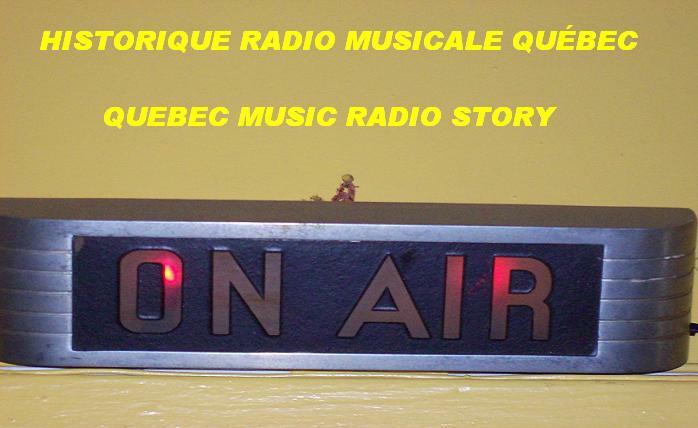 Historique Radio Musicale Québec/Quebec Music Radio Story :: La parole aux animateurs. (Disc-Jockey's speaking) :: Racontez-nous votre histoire. (Please relate your story here! )Thank you! My family and I are fine. This is Music000 or Paul from The Treasure Island Oldies Chat Room. The interview with Michael Godin was Fantastic! Great Job! Again, thank you for sending me a copy. I remember you were the first person that chatted with me when I entered The TIO Chat Room for the first time. Really appreciated that! You have a beautiful accent! Hope I am doing well in the Chat Room! You can trust me that I will not give out your E - Mail address to anybody. I was thinking, how many people like Guylaine get an opportunity to interview their favorite DJ! The interview made me think back to my favorite DJ that I grew up with. What a career!!! You are very Blessed to have your own show and to bring much happiness to many people throughout the world! Also, we should be thankful for the talents God has given us! God puts certain people in our life for a reason! I am really glad that I know you! Michael is very nice and a great gentleman. Have a safe, beautiful and Blessed day in The Lord Jesus Christ. S - M - I - L - E !!! Well I finally sat down and listened to your extensive interview with Michael Godin. He sounds like an amazing man who has played a big role in the history of radio in Canada, and in the development of "muscal performers" known throughout the world. Of course, being from the US, I'm not familiar with the various stations in Canada, but I can surely hear that you admired him from your listening to him on the radio yourself. His progressing from a radio DJ, to a programmer, then an A&R person for performers was fascinating. My ears perked up right away when I heard that he was involved in the career of Gino Vannelli, and played a role in the many other famous musicians and bands that the whole world is familiar with today. As you said, he is very modest. I know I had never heard of his name, but he did great things behind the scenes as a great producer. It was interesting to hear him speak of arranging the order of the songs for "Side 1" and "Side 2 of Bryan Adams record. Funny that today there is no more Side 1 or 2 to deal with!! Thanks again for another great interview, your best yet!!! I hope to see you soon in one of the radio listening chat rooms. Oh, and you also got me to listen to "Treasure Island Oldies" too! It was great to pay tribute to the King of Rock and Roll, Elvis Presley on this week's show. It was August 16, 1977, the day Elvis died at his Graceland Mansion in Memphis. And what a fitting way to recognize the King of Rock and Roll than to feature him exclusively for the Rock and Roll Reunion. It was great to hear some of the lesser played songs such as My Baby Left Me and I Need Your Love Tonight. I was also was pleased to recognize and spotlight the late Les Paul on this week's Lounge Double. What an amazing and unassuming man and so talented and creative. I hope you enjoyed hearing his 1950 recording of Nola as well as his signature song, How High The Moon, with his then wife Mary Ford. Speaking of Les Paul, in addition to the posting of his obituary and the video clip, this week the Treasure Island Oldies Blog features another great duo performance by Les Paul and Mary Ford with The World's Waiting For The Sunrise, our Song of the Week. Enjoy! The Chat Room was packed once again this week and it was great to welcome back Becky aka Ogopogo from Westbank, British Columbia in the beautiful Okanagan Valley. And a great pleasure to have Marilyn aka Sistahmar from Kitchener, Ontario. It's been several years since she was last able to come by for a visit, but she promises to come back again next week and every week. She is also the moderator for the chat room for a good friend of mine, Rock & Roll Hall of Fame DJ David Marsden. David is on the air every Thursday and Friday night from 7 to Midnight Eastern time. Be sure to have a listen via marsdenglobal.com for the Marsden Theatre. You'll be well entertained. Be sure to join us for our next two specials: on August 30th it's our Annual Back To School Special, and then the next week, September 6 our Motown Special, which will include The Motown Story, a great documentary. What a great way to wind up summer with these two great specials. Please note that there is no live show on September 6 and I have pre-recorded the Motown Special for your enjoyment. The fabulous voice of Tony Williams will be spotlighted next week on Voice Your Choice as the lead singer of The Platters with two of their big hits songs for your votes: Only You and Smoke Gets In Your Eyes. Which song would you prefer to hear? Cast your vote. Click the Voice Your Choice button and make your selection. We'll play the winning song in the third hour of next week's show. A big hello to Lou Grimaldi in Floral Park, New York. He sent in a photo for the Treasure Island Oldies Listener Gallery. It's now posted and available for viewing. Click the Listener Gallery button available to you on most pages of the website. And please send in your photo too; it would be great to have your picture mounted in the Listener Gallery. Send your photo, name, city and state or province to michael@treasureislandoldies.com. By the way, Lou was introduced to the show by Guylaine Coté in Quebec City, Quebec, a listener and regular in the Chat Room. Lou said he very much enjoyed the interview I did with Guylaine, as well as the show. Speaking of the interview, you can click here http://www.treasureislandoldies.com/assets/multimedia/MG_GC_Interview_July_2009.ram to listen. I was also pleased to hear from Andy Desilets from Ottawa, Ontario, the capital city of Canada. He said he was listening to the Instrumental Gems Wordless Wonders Special for the fourth time! He also requested to hear Don't Ask Me Top To Be True by Montreal's J.B. And The Playboys. Andy, you'll hear it on next week's show. Thanks for getting in touch. And if you have a song you'd like to hear, click the Requests button on any page of the website or call our 24/7 Listener Request Line at 206-203-4678 and record your voicemail message. I'll do my very best to play your song on the show. Finally, if you have a birthday coming up or you want to celebrate someone else's birthday please send the details to me: your name, birthday date as well and the city, province or state and country to michael@treasureislandoldies.com and I'll play our official birthday song for you to recognize the special day, Birthday by The Beatles. Just wanted to let you know that I listened to your interview with Michael and I thought it turned out just great!! I really liked hearing about Michael's career in radio and also when he was a young boy and making little shows with his mom's sewing machine!! That was so cute!! LOL! I thought you did a really good job of coming up with some mind provoking questions for Michael (like asking him his 10 favorite songs of all time) and just the interview itself. Genial Entrevue!! ]Merci beaucoup and I'll see you in the Hut on Sunday! !